A girl stands at the edge of a black doorway. She is wearing a simple striped cotton dress and perhaps a hair slide. Nothing about how she stands tells us she will ever step off the concrete foundations. She watches us, her hands held loosely in front of her. A man leans against the wall beside her. He is dressed formally in suit as black as the house interior, a tie and a hat. His hand is in his pocket. His eyes are on the girl. I have the poet and performer Brian Catling to thank for introducing me to this house. It is not the first house I have ever known. But it is very close. Although there is no strip of blue sky or green grass, and no radiating sun, it is simple and symmetrical and archetypal. It is the house we build and unbuild forever. ‘It’s my home. Nothing bad has ever happened to me here.’ Sonia Szurma still lives in the detached, pebble-dash house in Bradford she and her husband, Peter Sutcliffe bought for £16,000 in 1977, before he became known as the Yorkshire Ripper. Another tidy, featureless house; the single garage where Peter kept his tools, the kitchen where he washed his soiled clothes, the garden where he burned incriminating evidence. Her home. In the early 80’s Brian Aldiss granted me an option on his 1977 teratological novel, Brothers Of The Head. It is the tale of conjoined twin brothers, Tom and Barry Howe – from their birth on the windswept, bleak Norfolk marshes, to their grooming into a novelty punk band, to their inevitable demise. We never see or hear from the brothers themselves, only learn about them through others. As with Jekyll and Hyde, we can never enter the private rooms of various players, only listen to the accounts of what they say took place there. The witnesses claim the dead and keep them locked away. The window of Aldiss’ study in Blakeney looked out across the water to the same tiny house I had seen. When we shot the film we used the house. We installed mum and dad and the conjoined Howe twins. Tom and Barry will always live there. 1931, the Isle of Man. The Irving house. No radio, no electricity, no gas. The north wind coming in off the Irish Sea was an intense irritation to James Irving. It may even have frightened him. So he slathered the entire exterior of the house in concrete. Still the wind penetrated the wintery home he shared with his wife, Margaret, and 12-year-old daughter, Voirrey. So he built wooden panelling throughout, insulated their home against the exterior. And the house fell silent. Until Gef came. The spitting, growling sounds coming from behind the wooden panelling turned out to be not that of a rat, but a talkative mongoose. It proclaimed its identity in a number of ways: ‘I am of a strange creature. I have hands and feet and you would faint if he saw me. You would freeze and turn to stone or a pillar of salt!’ Gef, an entity or familiar or presence, attached itself to the family for six years by which time they would leave a portion of their food for him during meals. Some 60 years after Gef first arrived at the Irving house, Catling and I tracked Voirrey down to her new home. There was no doubt Gef still existed, no doubt he was still looking out for Voirrey. ‘Some say that all this is engineering because I was a ventriloquist… The story is not an engineering. But I hope it never happens.’ Voirrey died in 2005. Perhaps now Gef is free to return to the Land of Mists from whence he came. Referring to Sonia Szurma, the Mail Online dishes out the customary punishment normally reserved for returning vampires: ‘Her once flowing jet-black hair is now greying and unkempt. The smart wardrobe – and trademark designer sunglasses – replaced by scruffy clothes, lines under her eyes and unflattering tracksuit bottoms.’ The Wests’ home at 25 Cromwell Street in Gloucester was erased down to its bloody roots. Now a landscaped path cuts through the terrace. Every brick was crushed and every timber was burned. 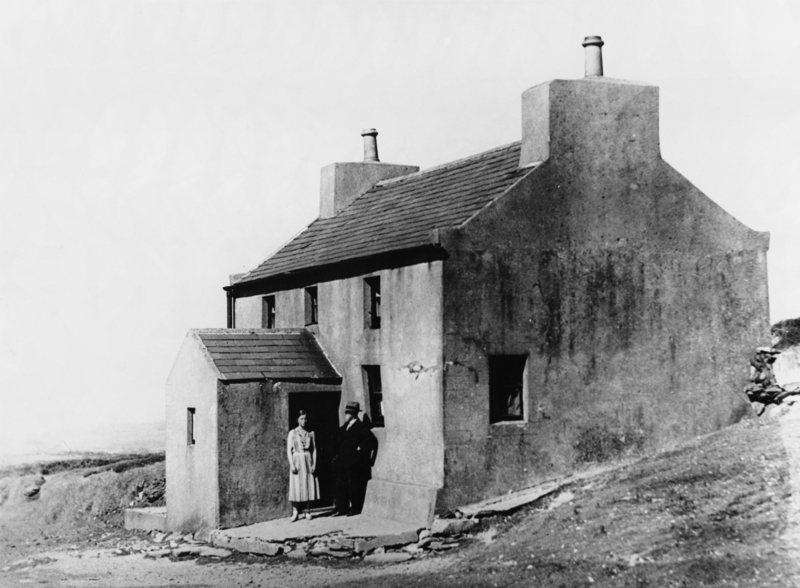 When Brian Catling and myself went in search of the Irving house on the Isle of Man the only trace we found was a wooden post spiked with hammered iron, and a lump of the concrete foundations which I still possess. Tom and Barry’s house still stands on Blakeney Point. In that house, a third nascent head slept and listened and learned to ventriloquise. This third brother was later to be born on the back of his weaker sibling’s death, in Aldiss’ book if not in the film. There are things that must not and cannot be seen outside and publicly. The notoriety and investigations of the event are now all but forgotten. Only fragments and shadows can be summoned to bear witness to that which has vanished. ‘Talking Mongoose’, by Harry Price. Photograph courtesy of Mary Evans Picture Library. ‘Vanished! A Video Seance’, by Tony Grisoni & Brian Catling can be watched here. Posted on February 25, 2013 December 8, 2016 by vsmallfires	This entry was tagged Gef, Harry Price, the Talking Mongoose, the Yorkshire Ripper, Tony Grisoni. Bookmark the permalink.